For other persons with the same name, see Charles, Duke of Berry (disambiguation). Charles of France, Duke of Berry, (31 July 1686 – 5 May 1714) was a grandson of Louis XIV of France. Although he was only a grandson of Louis XIV, Berry held the rank of fils de France ("son of France"), rather than petit-fils de France ("grandson of France"), as the son of the Dauphin, heir apparent to the throne. The Duke of Berry was for seven years heir presumptive to the throne of Spain (1700–1707). Born at the Palace of Versailles, Charles was the youngest son of Louis, Dauphin of France, "le Grand Dauphin", and of Maria Anna Victoria of Bavaria. One of three children, he was the uncle of the future Louis XV, the son of his brother, Louis, Duke of Burgundy. Charles other brother, Philip, Duke of Anjou, was the future Philip V of Spain. Charles was styled Duke of Berry (duc de Berry) at his birth, but never actually possessed that Duchy. In 1710, he was invested with his apanage, consisting in the duchies of Alençon, of Angoulême, county of Ponthieu and other minor fiefs. Ponthieu was exchanged some month later for other domains. 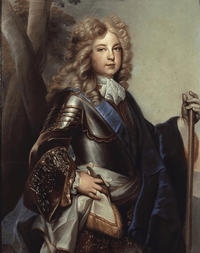 By a special brevet, his grandfather permitted him to keep the title "Duke of Berry", which he held until his death..
As the third son of the Dauphin, Berry was not expected to inherit the throne; and at his father's death in 1711, his oldest brother Louis, Duke of Burgundy became Dauphin. However, in agreement with the testament of Charles II, king of Spain, the Duke of Berry was heir presumptive to the Spanish throne from November 1700 until 15 August 1707 (birth of his nephew Louis, Prince of Asturias). He renounced all his rights to the Spanish succession on 24 November 1712, in application of the treaties of Utrecht. As a result of the prestige of his birth, cadet branches of the royal family saw in him a splendid match for their daughters. One of his aunts, Louise-Françoise de Bourbon, princesse de Condé, a legitimised daughter of Louis XIV and Madame de Montespan, proposed her beautiful daughter, Louise Élisabeth de Bourbon, but the marriage proposal came to naught, much to the annoyance of the House of Bourbon-Condé. The Princess de Condé's sister, Françoise-Marie de Bourbon, duchesse d'Orléans, then suggested a union with her eldest daughter, Marie Louise Élisabeth d'Orléans. The marriage with Marie Louise Élisabeth, daughter of Philippe d'Orléans, Duke of Orléans, the future Regent of France, took place on 6 July 1710. A miscarriage ended the first pregnancy of Marie Louise Élisabeth who then gave birth to a prematured boy who lived just a few weeks. She was again pregnant at the death of her husband but miscarried a girl one month later. The Duchess was notoriously unfaithful to her husband and even thought of running away with her lover La Haye. At first he was passionately fond of his wife; but at the end of three months he fell in love with a little, ugly, femme de chambre. The Duchess, who had sufficient penetration, was not slow in discovering this, and told her husband immediately that, if he continued to live upon good terms with her, as he had done at first, she would say nothing about it, and act as if she were not acquainted with it; but if he behaved ill, she would tell the whole affair to the King, and have the femme de chambre sent away, so that he should never hear of her again. By this threat she held the Duke, who was a very simple man, so completely in check, that he lived very well with her up to his death, leaving her to do as she pleased, and dying himself as fond as ever of the femme de chambre. A year before his death he had her married, but on the condition that the husband should not exercise his marital rights. He left her pregnant as well as his wife, both of whom lay-in after his decease. Madame de Berry, who was not jealous, retained this woman, and took care of her and her child. One month later, the Duchess gave birth prematurely to a girl who died the next day. During the regency of her father, the young widow became known as a Messalina, ill-reputed for the debauched life she led in her Luxembourg Palace. Her health rapidly undermined by gluttony, alcoholism and a series of clandestine pregnancies, Madame de Berry died on 21 July 1719. The autopsy revealed that the princess was again with child although she had almost died at the end of March 1719, when giving birth to a still-born child allegedly fathered by her captain of the guards. In 1712, Berry's eldest brother, Louis, Duke of Burgundy, Dauphin of France, and the later's elder son, Louis, Duke of Brittany died. It was foreseeable that Berry would serve as Regent for his brother's younger son, Louis, Duke of Anjou. But, on 5 May 1714, he died from internal injuries sustained in a hunting accident. His death rendered the details of the Regency less straightforward than before. The Duke and the Duchess of Berry had three children, none of whom reached one month of age. As Grandchildren of France, they needed a surname. 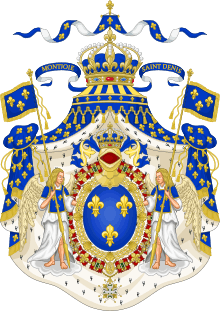 However, since their father was Duke of Berry only by name, their surname was not "de Berry" but "d'Alençon", taken from his first substantial duchy. Stillborn daughter (Palace of Fontainebleau, 21 July 1711), Mademoiselle de Berry. Charles, Duke of Alençon (Palace of Versailles, 26 March 1713 – 16 April 1713, Palace of Versailles). Marie Louise Élisabeth (posthumously, Palace of Versailles, 16 June 1714 – 17 June 1714, Palace of Versailles). Coat of arms of Charles, Duke of Berry. The Duke of Berry assumed the royal arms (Azure, three fleur-de-lys or) differenced with a bordure engrailed gules, the mark of cadency traditionally associated with the Duchy of Berry since the 14th century (despite the fact that he never actually received that Duchy as an apanage, but the Duchies of Alençon and Angoulême to which other arms were associated) and with the coronet of a Child of France above the shield. Mitford, Nancy, The Sun King, first edition by Harper & Row in 1966. ↑ See the Letters patent: Louis, par la grâce de Dieu, roy de France et de Navarre, à tous présens et à venir, SALUT. (…) Notre très-cher et très-amé petit-fils Charles, fils de France, a dignement répondu à nos espérance (…) Pour ces causes et autres à ce Nous mouvans, de l’avis de notre conseil, Nous avons donné, octroyé et délaissé, et par ces présentes signées de notre main, donnons, octroyons et delaissons à notredit petit-fils Charles, fils de France, et à ses enfans mâles descendans de lui en loyal mariage, pour leur appanage et entretenement, selon la nature des appanages de la Maison de France et les lois de notre royaume, les duchés d’Alençon et d’Angoulême, le comté de Ponthieu et les châtellenies de Coignac et de Merpins, réunis à notre couronne par le décès de notre cousine Elisabeth d’Orléans, duchesse de Guise, ensemble les terres et seigneuries de Noyelles, Hiermont, Coutteville et le Mesnil, par Nous acquises par contrat passé entre les commissaires par Nous nommez, et Marie d’Orléans, duchesse de Nemours, le 16 Decembre 1706, en échange de la baronie, terre et seigneuries de Parthenay (…). ↑ http://www.chivalricorders.org/royalty/bourbon/france/success/d1tstch2.htm: We do declare, with reference to the stipulations made above, that, if the said Duke of Anjou should die before We are Ourselves called to God, or should He accede to the Throne of France and prefer to wear that Crown rather than that of these Our Realms, then the said Crown shall pass to the Duke of Berry, His brother, and the third son of the said Dauphin, and that all the conditions set out above shall pertain in this eventuality. ↑ Journal du Marquis de Dangeau (on 3 January 1712): J'appris que les enfants de monseigneur le duc de Berry ne porteront point le nom de Berry, mais celui d'Alençon; comme les enfants de Monsieur portoient le nom d'Orléans, ceux-là porteront celui d'Alençon. Je ne sais si j'ai su cela dans le temps que cela fut fait, mais je l'écris en cas que je l'aie oublié. ↑ Journal du marquis de Dangeau (on 26 March 1711): Le roi, avant la messe, alla voir M. le duc d'Alençon ; c'est le nom du prince dont madame la duchesse de Berry est accouchée cette nuit à quatre heures.